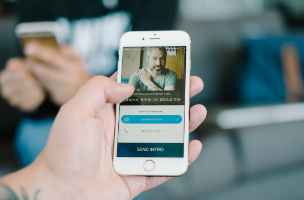 About.me has announced the launch of its spinoff app, Intro, which allows users to create and share digital business cards, easily connecting with new individuals and storing their contact information for easy future reference. With Intro, users signup with their Facebook or about.me accounts, and can customize their digital business card with the appropriate email address, contact photo and phone number they’d like to share with others. If users connect to Intro with their Facebook account, the app automatically pulls in the account’s associated email address, but users can update this to another email if it’s more appropriate. The app also pulls in a user’s location and profile picture. Users can add a contact phone number to their Intro profile, before sharing this with other users. Each time someone meets a new contact, instead of sharing a physical business card that can be easily lost, they’re encouraged to share their about.me profile within Intro by entering the contact’s email address, phone number or about.me username. When emailing, for instance, the contact receives an email, including a link to visit the user’s complete profile, which contains buttons to send compliments to the user, a button to instantly email the contact and more. If the introduction is sent through the app (via the about.me username), an email is also sent, but the person’s information appears within the app itself, under the “Shared With Me” section. This keeps track of all of the content profiles users have received, based on date. Viewing a user’s complete profile takes place in the iPhone’s web browser, or users can simply add the contact directly to their Address Book. Back in the app, users can also keep track of the information they’ve sent in the “My Shares” section. Intro is available to download for free on the iTunes App Store. Another digital business card app, Olocode Plus, was released earlier this month.